What a year it was! It started with an earthquake, followed by rising tension. In the previous years I had to think hard to make up a decent blogging subject, this year it was enough to just sit and wait for the next breaking news. 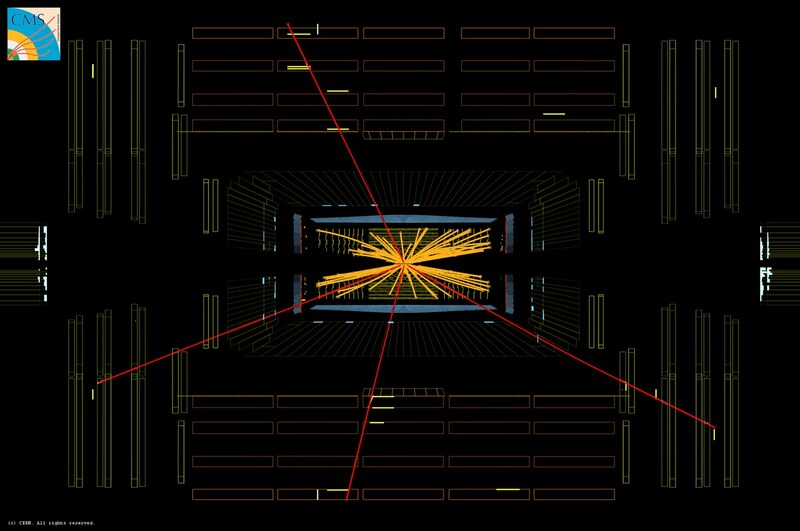 Here's a pick of the most important events in the particle world in the year 2011. Measurements of the forward-backward asymmetry of the top pair production at the Tevatron have been showing interesting hints of new physics for a long time. CDF found that this asymmetry displays a very steep dependence of the energy of the colliding partons (that is on the invariant mass of the top pair) which represents a 3.4σ departure from the Standard Model predictions. Unfortunately, later on D0 did not confirm the steep mass dependence, and we need to wait more for the matter to be clarified. CDF studied the invariant mass spectrum of jet pairs produced in association with a W boson, and found a bump near the 150 GeV dijet mass. After the subsequent update, the significance of the bump exceeded 4σ. It would be a clear evidence of new physics if not for the evil D0 who did not find any bump in their data. The origin of the bump will probably remain a mystery forever, much like the Roswell incident, because the Tevatron management is not very determined to resolve it. 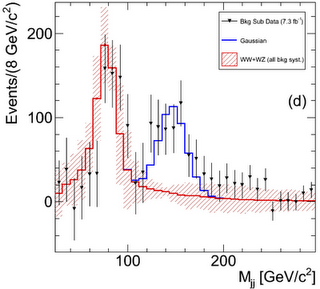 Dark matter searches gain sensitivity at an impressive pace. Xenon100, currently the most sensitive detector for the vanilla dark matter particles, published the results based on the first 100 days of running. No luck so far. As a consolation, for each experiment that does not find dark matter there is one that does; this year CRESST joined the latter club, while CoGeNT announced an annual modulation of its detection rate. In any case, the hunt continues, it will take several more years before we may conclude we're looking in the wrong place. Higgs has been finally cornered and we think we're seeing the tip of his hat. 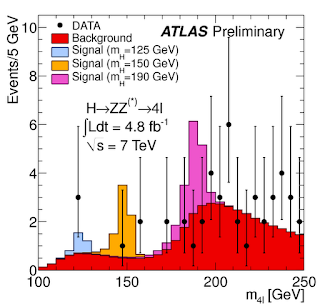 Both ATLAS and CMS observe an excess of events in the γγ, ZZ and WW channels consistent with a Higgs boson of mass around 125 GeV. To be continued and ultimately resolved in 2012. Today CERN presented the latest Higgs search results. But, first things first. The live podcast of the seminar was stalling, choking, or breaking down completely. Well into the 21st century a huge international lab doing cutting edge science (and boasting of inventing the world wide web) is unable to provide a smooth transmission of its most important public presentation of the year. One may call it ironic, or repeat Didier Drogba's famous words after the 2009 Champions League semi-finals. OK, after venting my anger I can talk some physics. 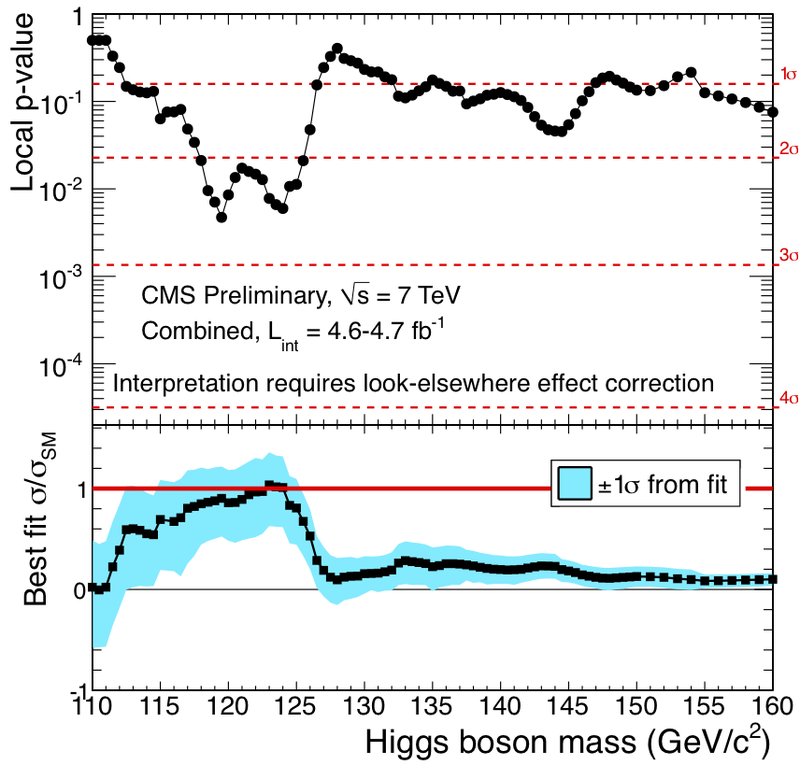 The main news, correctly rumored on blogs before, is that there is a significant excess of Higgs-like events corresponding to the Higgs mass of ~125 GeV. More precisely, the local significance of the ATLAS excess is 3.6σ, or 2.5σ sigma when the "look-elsewhere effect" in the 110-146 GeV mass range is taken into account. For the CMS the significance is somewhat smaller: 2.6/1.9 with/without the look-elsewhere effect. Separately, these excesses would be shrugged off; combined, they are very suggestive that we're seeing the real thing at last. 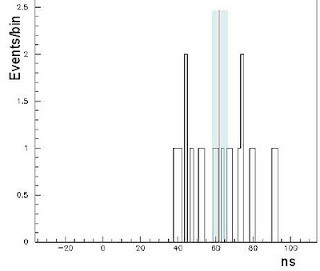 In ATLAS, only the H→γγ and H→ZZ*→2l+2l- channel have been updated with the full 2011 dataset. Those are the ones where statistics is limited due to the small Higgs branching fractions. However, in these final states the 4-momentum of the Higgs can be fully reconstructed to a good precision, offering a very good mass resolution of order 2 GeV. CMS updated all main channels, also those that do not provide a lot of mileage near 125 GeV at this point. The excess is seen by both experiments and in each of these channels. The excess in H→γγ peaks around 124 GeV it CMS, and around 126 GeV in ATLAS, which I guess is perfectly consistent within resolution. 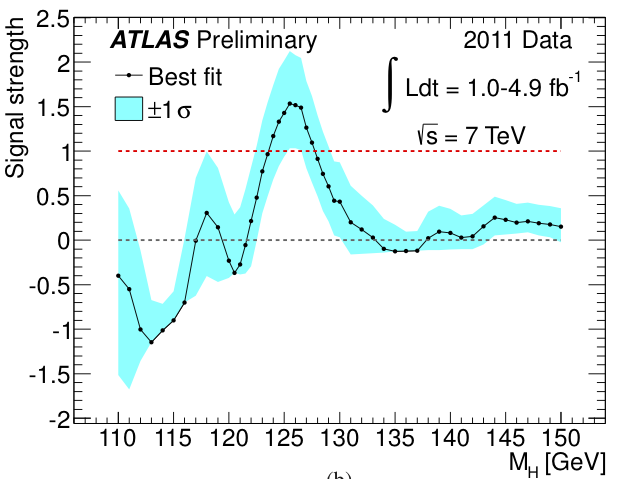 In the 4-lepton channel, ATLAS has 3 events just below 125 GeV, while CMS has 2 events just above 125 GeV. On top of that there's the long-standing excess in the H→WW*→l+l-2ν channel, which however is not the driving force anymore. It's is precisely this overall consistency that makes the signal so tantalizing. 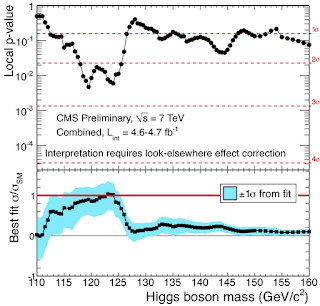 CMS now excludes Higgs down to 127 GeV. The ATLAS limits slightly worse around 130 GeV, but thanks to lucky background fluctuations they happened to exclude the low mass region between 112.7 and 115.5 GeV. The latter is a spectacular confirmation that what the ALEPH experiment saw back in 2001 was a genuine fundon (fundons are elementary particles produced in high-energy collider near the end of the budgetary cycle). So much for now. The ATLAS and CMS combination notes are already out. 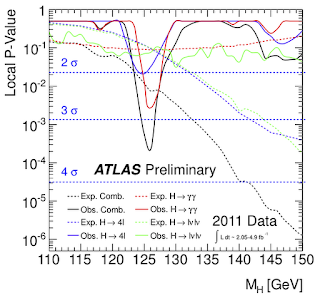 Tomorrow the ATLAS and CMS experiments will reveal new results of the Higgs search based on the full 2011 dataset. The date of the presentation was not chosen accidentally: December 13 is the anniversary of the capture of Saddam Hussein. Is this suggesting that tomorrow we'll see another notorious fugitive dragged out of its hole? Neither experiment will announce the discovery of the Higgs, in the sense of a signal with a significance of 5 sigma. 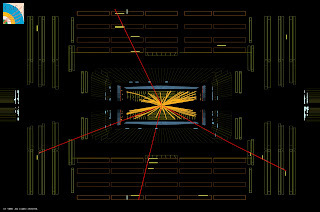 Neither experiment will exclude the Standard Model Higgs over the whole low-mass range. The Standard Model Higgs boson is excluded down to approximately 130 GeV, but not below. As already reported widely on blogs, both experiments have an excess of events consistent with the Higgs particle of mass around 125 GeV. 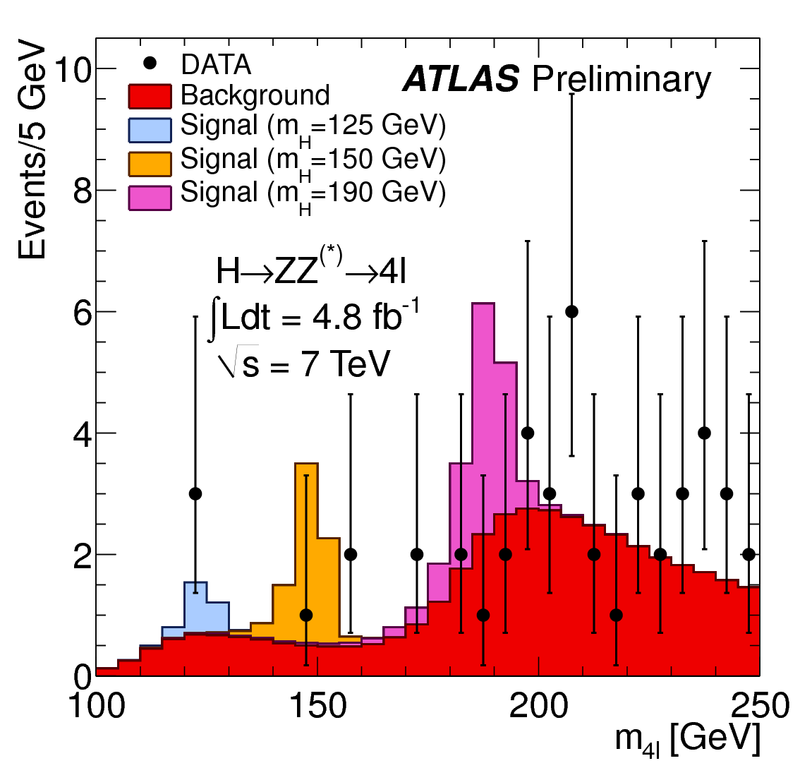 The excess is larger at ATLAS, where it is driven by the H→γγ channel, and supported by 3 events reconstructed in the H→ZZ*→4l channel at that mass. The combined significance is around 3 sigma, the precise number depending on statistical methods used, in particular on how one includes the look-elsewhere-effect. 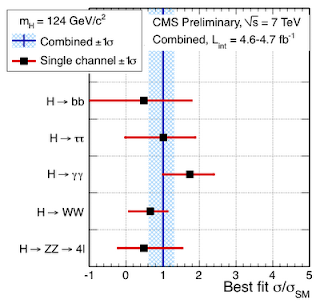 CMS has a smaller excess at 125 GeV, mainly in the H→γγ channel. 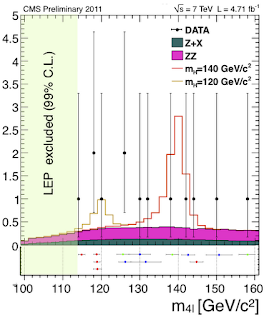 They have 3 events in H→4l as well, but they are oddly shifted to somewhat lower masses of order 119 GeV. 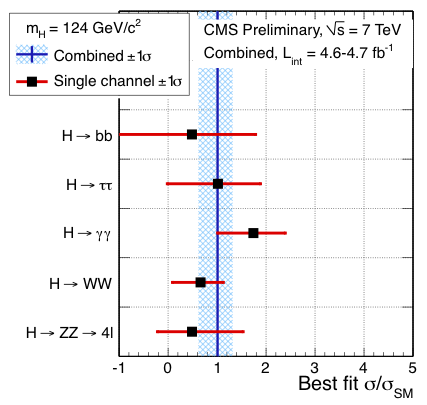 All in all, the significance at 125 GeV in CMS is only around 2 sigma. With some good faith, one could cherish other 2-sigmish bumps in the γγ channel, notably around 140 GeV. Those definitely cannot be the signal of the Standard Model Higgs, but could well be due to Higgs-like particles in various extensions of the Standard Model. Stay tuned, in about 24 hours we'll know everything there is to know. More in-depth interpretations of the ATLAS and CMS findings depend on the quantitative details of the results, in particular, to what extent the signals in various channels are consistent between the 2 experiments and with the predictions based on the Standard Model Higgs. There is a good chance we're finally looking at the real thing, I'd say 50% based on the data alone and 80% adding our sincere convictions that Higgs must really be in that mass range. 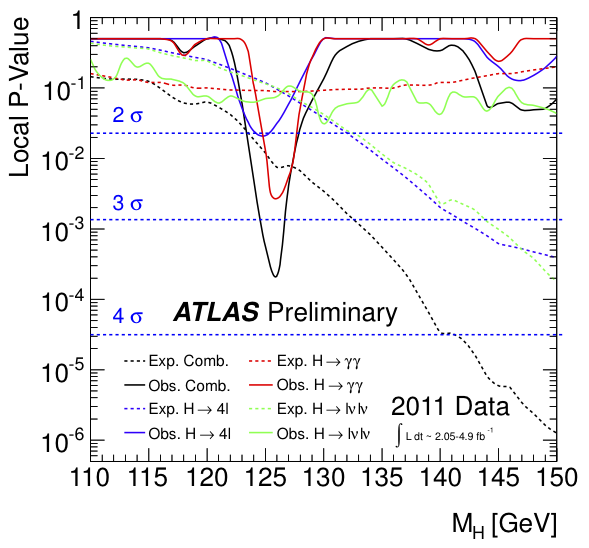 However, one should not forget that last summer the combination of ATLAS and CMS 1 fb-1 results was showing an excess corresponding to a ~145 GeV Higgs with the significance as large as 4 sigma, which was blown away when more data arrived. This post came out a bit cryptic. Don't even start if you're not a huge fan of flavor physics. There's been some new developments since 2 weeks ago when LHCb came out with the evidence of CP violation in the charm meson sector. Recall that LHCb studied the D-meson decay to π+π- and K+K- meson pairs. The observable of interest was the asymmetry of D- and anti-D-meson decay rates to these final states, A(π+π-) and A(K+K-). A non-zero value of any of these two asymmetries signals CP violation (particle and anti-particle decay rates to the same CP eigenstate being different). LHCb found that the difference ΔA = A(K+K-) - A(π+π-) is (-0.82±0.24)%, which means that, with large confidence, at least one of these asymmetries is non-zero. 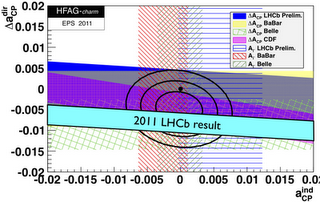 The most pressing question is whether the LHCb result implies new physics? Experts emphatically agree that the answer is definitely maybe. From the existing literature one can learn that "...CP violation from new physics must be playing a role if an asymmetry is observed with present experimental sensitivities O(1%)", and "...observation of CP violation in the decay of D mesons will not necessarily be a signal of new physics...". Now, a paper from last week makes a reassessment of the Standard Model predictions and clarifies the LHCb result may or may not signal new physics. The problem is that we are lacking reliable methods to compute processes involving D mesons. Normally, when dealing with heavy flavored mesons, one employs an effective theory where the heavy Standard Model and possibly new physics particles have been integrated out, leaving effective 4-quark interactions. This allows one to compute observables at the leading order in the expansion in powers of (1 GeV/m_quark), the former being the typical scale for QCD effects, and the latter the suppression scale of higher-dimensional operators. That is a decent expansion parameter for bottom quarks, but not so much for charm quarks. 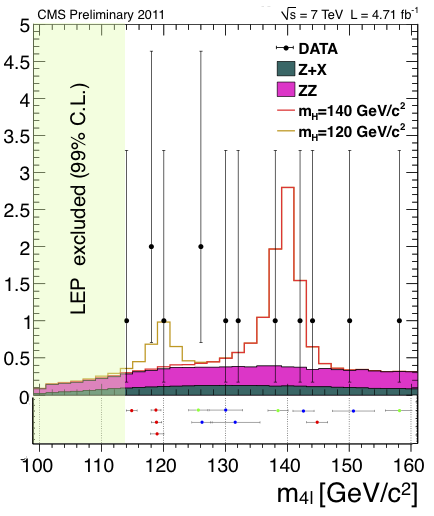 Now, ignoring that convergence issue and taking the leading order predictions at face value one arrives at the estimate ΔA∼0.1%, well below the value measured by LHCb. The new paper by Brod et al. attempts to estimate the contribution of the higher order operators to the asymmetry, using some guidance from other experimental data on D-mesons. For example, one finds that the branching fraction for D0 → K0 K0bar, which receives contributions only at next-to-leading order in 1/mc, is about five times smaller than the branching fraction of D0 → K+ K-, which received leading order contributions. That means that the respective amplitudes differ only by a factor of two, which in turn proves that the higher order 1/mc contributions can be significant. Taking that into account, the paper concludes that the Standard Model can account for |ΔA| as large as 0.4%, uncomfortably close to the LHCb measurement. Another last week paper takes a less pessimistic approach. 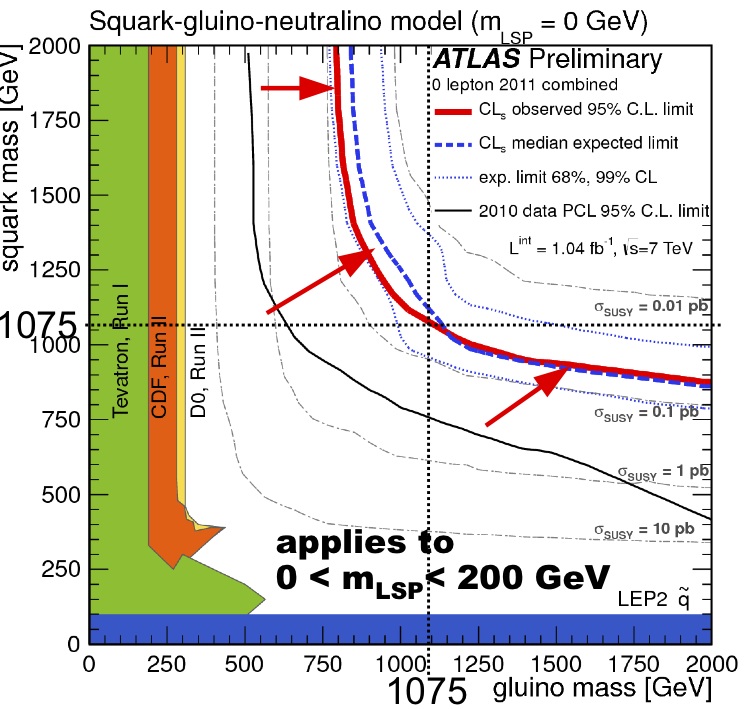 It simply assumes that the asymmetry measured by LHCb is dominated by new physics and attempts to understand constraints on the underlying model. In the language of effective theory, to explain the LHCb result one needs to include a ΔC =1 four-quark operator (with 1 charm and 3 light quarks, [sbar Γ c][ubar Γ s]). There are many possibilities differing by the structure of Lorentz and color indices that lead to the same observable asymmetry. The scale suppressing this higher dimensional operator should be of order 10 TeV to match to the LHCb result. This is actually a very small suppression. 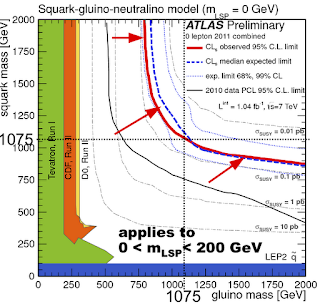 From non-observation of CP violation in D meson mixing we know that the scale suppressing generic ΔC=2 4-quark operators (with 2 charm and 2 light quarks) must be close to 10 000 TeV. On the other hand, once a ΔC=1 operator is present, ΔC=2 ones will necessarily be generated by loop corrections. This means that a random new physics model explaining the LHCb result will be in conflict with the data on D-meson mixing. However, the paper by Isidori et al. concludes that a subset of the ΔC=1 operators explaining the LHCb asymmetry is consistent with all other experimental data. 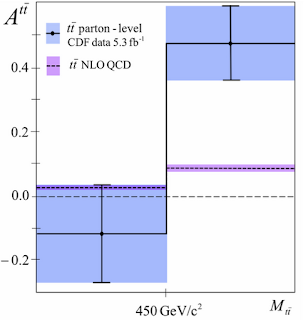 In particular, the ΔC=1 operators involving only right-handed quarks are not excluded by the data on D-meson mixing and on direct CP violation in kaon decays (ε'/ε in the flavor jargon). which can be directly compared to the LHCb result. 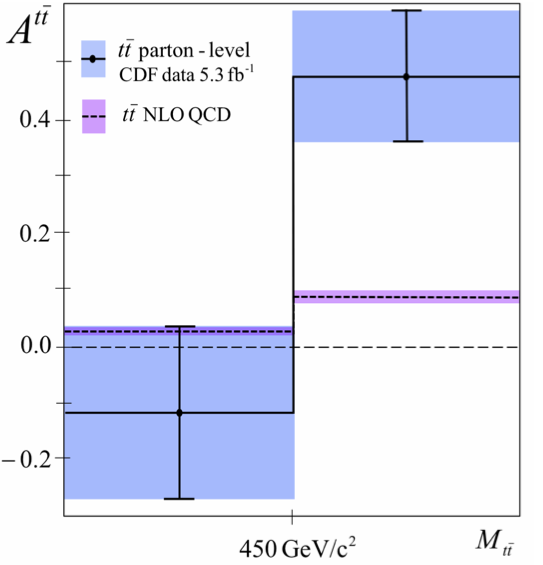 The CDF asymmetry difference is perfectly consistent with the LHCb one, and it's also consistent with zero. This is a hint that the true asymmetry difference is probably at a lower end of the range suggested by the LHCb measurement, and therefore closer to the Standard Model prediction. One more point for the Standard Model, but the game is not over yet.